Camera cage. 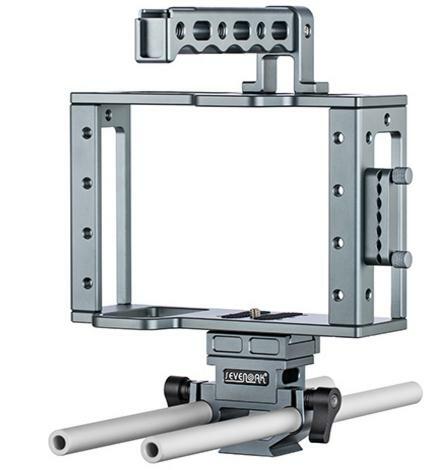 Since the camera cage is the core component that connects the camera directly, all the other components need to be installed from the camera cage. This makes the selection of camera cage very important. Based on the fact that mobile phones are now becoming a necessity for social life, Ms. Jiang Lei said: "The mobile phone can be our 'camera in front of my chest'. What matters is that we are on the scene and have the mobile phone picked it up. To be retained and then stable. " Sevenoak DSLR cage SK-C03 is a portable aluminum cage kit built for the most DSLR cameras which adds protection, stability and mounting options to the camera. It includes removable top hand grip, Mini HDMI to HDMI adapter cable, HDMI plug protector, quick release base plate, cold shoes, 1/4”and 3/8” mounting points etc. In addition, in the photography of "stability", he introduced the students to the tripod, monopod, tripod head, electronic control stabilizer, slide and cell phone camera expansion systems such as camera cage and so on professional equipment. While introducing, he always emphasized that when using these devices, he must pay attention to their kilograms and adaptability and avoid unnecessary troubles. Tripods camera stabilizer the camera for some kind of photographic effect. The most common is the use of a tripod for long exposures, while the monopod is more flexible and portable, although it is not suitable for long exposures. camera cage to the camera and mobile phone a shelf for easy installation of monitors, batteries, radio equipment, fill light equipment, so that photographers will be more convenient; stabilizer is an important video capture accessory that can assist in shooting travel video version of the sport, It basically can be divided into mechanical and electronic camp, the main body of the mechanical stabilizer is to control its balance, so the final piece quality with the operator's technology, experience is proportional to the operation of the electronic stabilizer more Simple, easy to use, compact, lightweight, easy to carry features.